Far back at the very beginning we were blessed to live in the Garden. Life was good there, in all respects. We were never cold. We were never hot. We didn’t have to worry about what we were going to wear. We were never even hungry. Until we saw that apple. We probably could have handled the temptation if it hadn’t been for that long creature with the flickering split tongue. And so, with the urging of a snake, we took a bite. A bite, only a bite. Just one. It was wrong indeed. And perhaps we deserved being kicked out of the Garden. Perhaps we deserved war and pestilence and hunger and ice ages and global warming and even having to wear clothes. But hey, come on. It was only one bite. We didn’t eat the whole darned apple. So surely, we didn’t deserve the outboard engine. 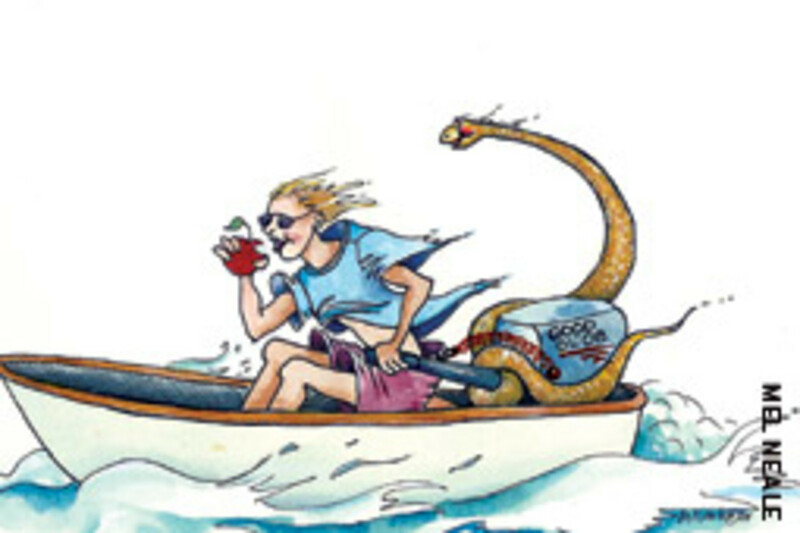 I figure I must have started eating apples at a very early age, because while that snake has been lounging in the garden, I’ve had far more than my fair share of outboards. The first one came when I was around 11 years old. 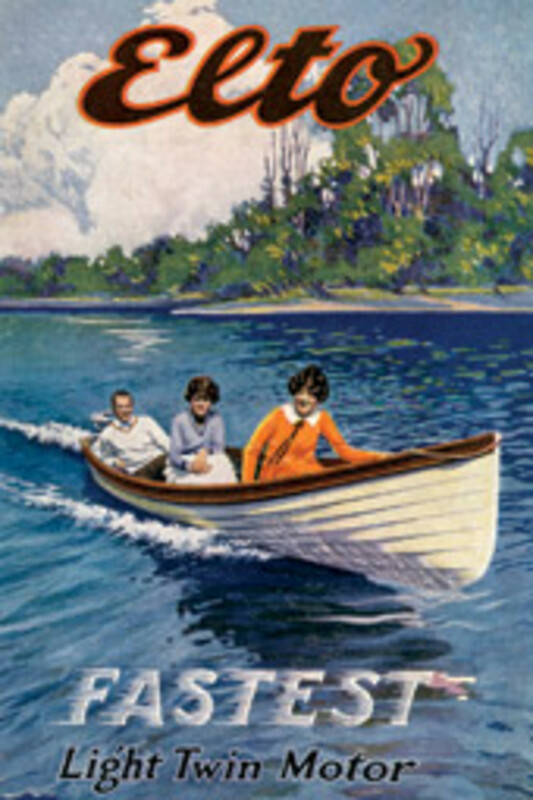 I had a 12-foot skiff that I had been rowing for two years. Things were wonderfully simple then. Then came the day that I committed what was, to my parents, the ultimate sin. (Their definition of my ultimate sins changed as the years went on.) I took off rowing down the river with a friend, leaving my little brother, whom I was supposed to be babysitting, on the beach. I didn’t really intend to leave him for long, and my middle brother was there to watch. And it was really more a case of stupidity than sin. It was stupidity because my friend and I, as we raced downriver, overlooked the fact that the tide was racing with us. We had longed for two summers to go as far as the red nun that was hardly visible in the distance down the river. We made it in what we assumed was record rowing time, but as we turned the boat to head back we noticed that the nun was heeled over and almost sucked under as the muddy water swept past it, swirling in little gurgling whirlpools. By the time we bucked that tide all the way back to the beach, our hands were blistered, our backs were burned, our throats were parched, and our parents were ticked — to put it mildly. My little brother was fine, playing on the sand under the watchful eye of my more sensible middle brother, but it was the principle of the thing. After appropriate disciplinary actions, my parents realized that perhaps the best way to save me from some day being swept away forever was to buy me a little 5-hp Johnson. Over the years I’ve often wondered if that wasn’t really an ultimate punishment, being booted from the garden of innocent simplicity. But I loved that outboard with a passion. I could go farther in an hour with my new engine than I could go in a whole day of rowing. I’ve never lost that first sense of freedom as the little skiff sped downriver, the wind blowing my hair and the smell of salt marsh teasing my nose. 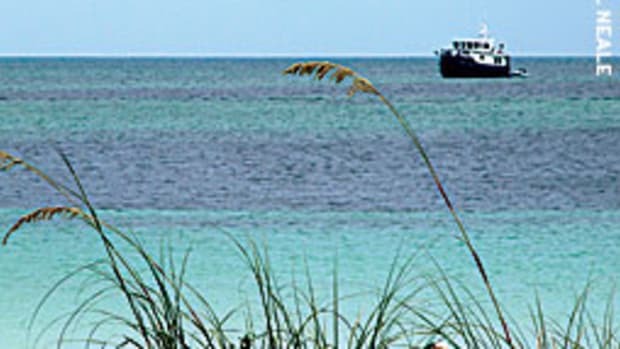 I loved that first outboard so much that in the winter, when cold weather forced me to pull my skiff far up on the beach, I carried the engine upstairs to my bedroom, mounted it on the foot of the bed, attached pulleys to the bed posts, and rigged a steering line so that I could steer my bed through my dreams. And I loved the smell of oily metal and decaying salty sea creatures that the motor imparted to my room. My mother didn’t. The second winter, my mother noticed an oil slick on the floor toward the stern of my bed. At first she assumed it was coming from one of the many unknown items I usually kept under the bed, but it soon became clear it was coming from that “machine that belongs in the garage.” It was forever banned from my bed. And then, during the following spring, came the first of many visitations of evil: My outboard wouldn’t start. I fixed it, of course, as I have the two dozen or more outboards I’ve owned since. But the experiences have yielded more than lessons in mechanics. 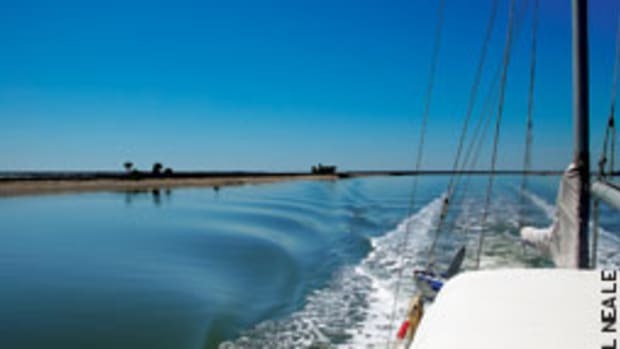 The problems with my outboards have covered the waterfront, but most have had to do with the fact that I have seldom been able to afford to buy a new one. 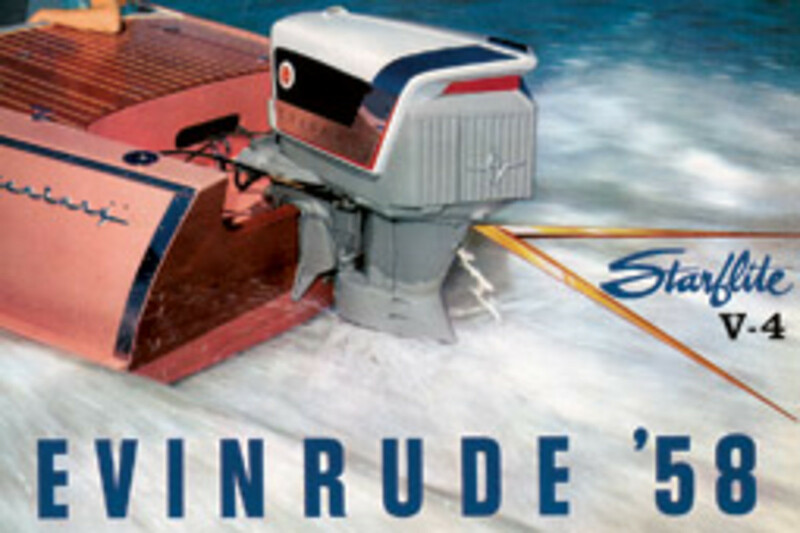 By my late teens I had graduated to an old 75-hp Evinrude, its main complaint being that it had been sunk on three different occasions before it graced my stern. I kept it going until I sold the boat to which it was attached and got a Tartan 27 sailboat with my very first inboard. For years I was grateful to the former owner for putting his boat on the market, complete with its wonderfully sensible inboard, thus finally saving me from the curse of the outboard. But as fate and my growing passion for boats would decree, this unfortunately didn’t end my career with outboards. Actually, this ended my career of buying outboards that had already been submerged and began my career of buying new ones and dropping them overboard. When you have a “big boat” with an inboard, it doesn’t take long to realize that you must have a dinghy with an outboard. At first the new outboards were the little twosies and threesies for my small dinghies. These ran so poorly that I actually hoped they wouldn’t start, because I knew they were going to leave me stranded about 10 minutes after I cast off. But as much as I hated them, I never dropped them overboard on purpose. It usually happened when I was transferring them from the mother ship to the dinghy, or when I was transferring them back from the dinghy to the deck, or when I sank the dinghy while towing it when I shouldn’t have been, or when I sank the dinghy from running it when I shouldn’t have been, and a lot of other times I’d just as soon not mention. However, as the years went by, I did learn a few things about submersible outboards. 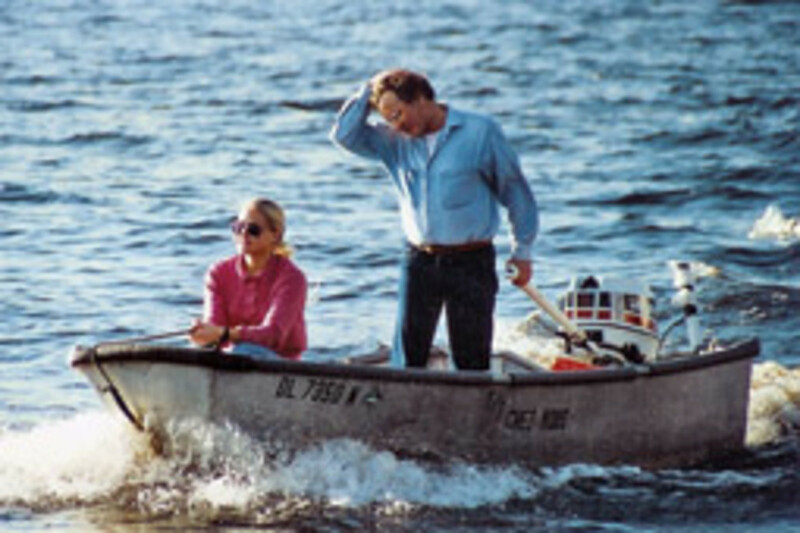 I learned it was always better to submerge an outboard while it was still attached to the dinghy. 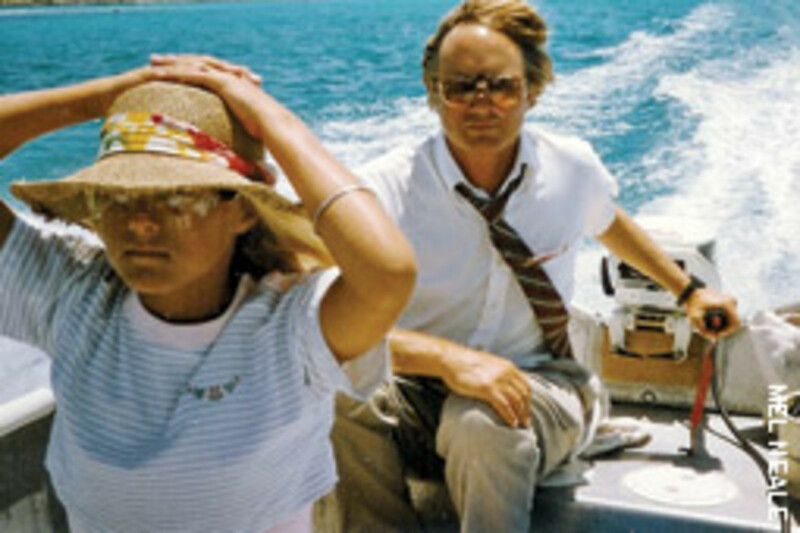 The dinghy usually remained afloat in one posture or another, so it was much easier to retrieve the outboard. I also learned that a straight, unadulterated drop into the waves while attempting to transfer the outboard meant a whole slew of additional problems. Early in the game, I bought a huge magnet with which I would try to find and pull up the outboard. But these magnets, despite the glowing claims in the advertisements, usually would get the motor to just under the surface, where I could see it, and then let go. So I learned to dive, feeling around the bottom until I found the thing. After the first time I tried to swim to the surface with one, I learned how to tie knots in the pitch blackness of a muddy river bottom while dying for air. I also learned it was always better to stop the outboard before dropping it overboard. The times they ran the best were when they were sinking beneath the waves sucking in all that water. I also learned all the tricks about what you do with a drowned outboard, not the least of which was to try to sell it as quickly as possible to somebody who didn’t have enough sense to ask the right questions. As my mother ships got bigger, so did my dinghies and, of course, their outboards. 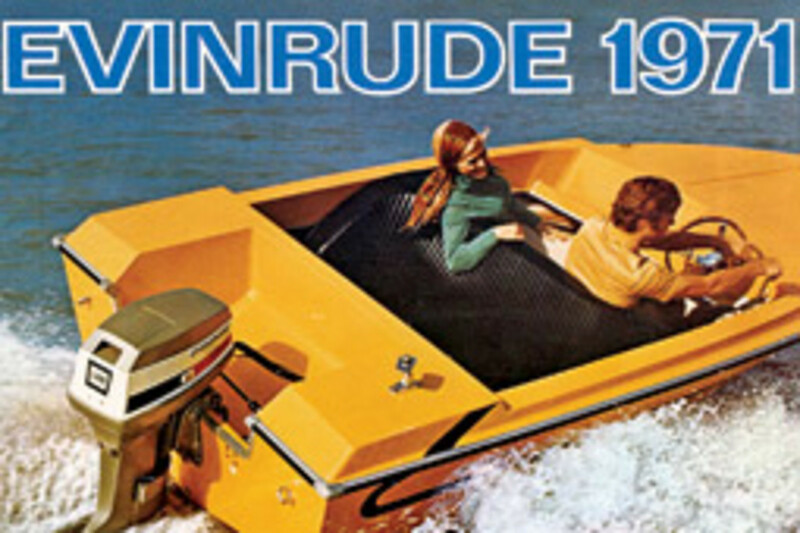 By the time I reached my late 20s, I had moved up to dinghies that needed 15-hp motors. I put them all to good use, including fishing. These outboards gave me many a pleasant day of trolling. Most of the trolling I’ve done has been while peacefully sitting in a small boat, lazily drifting in the general direction of Europe or Africa, watching my outboard propeller spin — not because the motor was running, but from the wash of the water flowing by as the wind blew me across the waves long after I gave up trying to restart the thing. If an outboard could hook a fish, maybe I’d feel better about all that time it hangs over the stern doing nothing. Now I have two dinghies, one with a 25-hp engine and another with a 15. I also have a 1985 Mako with a 1985 200-hp outboard. Through all these outboards, I’ve learned that they have much in common. The most obvious is that, pound for pound, they probably cost more than just about anything on earth, except maybe gold. I really don’t understand why outboards cost so much. You can’t sit in them, you can’t sit on them, they don’t have air conditioning or Bose sound systems, you can’t fly with them, you can’t sleep in them, and they won’t keep you dry when it’s raining. It’s just an outboard, not a car or a house or an airplane. How do they figure out the price of these things? I’ve been told there are various factors, one being that they must function in the “hostile marine environment.” This, of course, is true, but it’s not like anybody’s throwing hand grenades at them (although sometimes it seems like a good idea). They’re just slowly deteriorating like everything else on the boat. Another thing they have in common is the safety stuff. Much of the safety stuff on an outboard is like an ultimate oxymoron. Outboards are overwhelmed with gadgets to keep them from starting. Are you kidding me? Does anyone who knows anything about outboards really think that an outboard actually needs something extra to keep it from starting? That’s like buying a cow and paying extra so it won’t fly. 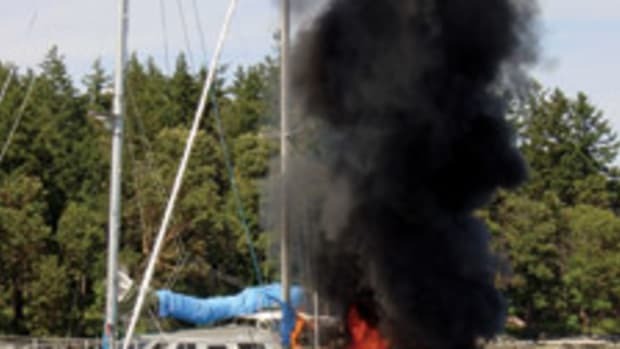 But outboard manufacturers, prompted I’m sure by those originators of all good things — government bureaucrats — have outdone themselves in inventing gadgets to help the outboard from doing what it already does best, which is not start. There are cogs and indented flywheels so they won’t start in gear except when the cogs are broken, and then they’ll start very nicely in gear except when they’re not starting for other reasons. 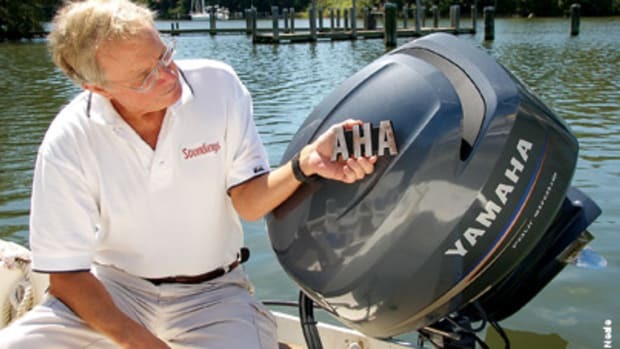 There are features to keep the motor from starting while the throttle is in the revved-up position, although that’s usually the only way outboards will start. And then there’s the aptly named kill switch, sometimes more aptly referred to as the “dead man’s switch.” These keep the outboard from starting unless you hook the cable onto the switch. This seems easy enough, but for some reason it just isn’t. Lots of extra starting batteries have been sold because so many of us forget to do this. Then these switches make the outboard stop when you’ve finally gotten it going. They say the purpose of these is to make the outboard stop when you’ve just fallen overboard or something like that. This is true, but in my experience, it’s never worked that way. The only times I’ve fallen overboard when using an outboard is when I’ve been straddling or leaning over an outboard that’s already stopped, trying to make the darned thing start. The only times a dead man’s switch has stopped an outboard for me have been when I least wanted it to stop. All kidding aside, I wouldn’t be caught dead or alive out here without being hooked up to a dead man’s switch. But for all that money, it looks like they could come up with a better way of doing it. They need to incorporate into the dead man’s switch a live dummy switch for those of us who, like me, always forget that we’re hooked up. I forget I’m hooked up when I lean over to pick up my bottle of water. I forget I’m hooked up when I lean out to net in a fish. I forget I’m hooked up when I move forward to change the fuel line from one tank to another so the motor won’t stop. But mostly I forget I’m hooked up every time I run up to the bow to catch a piling on the dock into which I’m about to crash. I hate hearing that motor abruptly stop just before I hit the dock. I’d much rather crash with the motor running, because my natural reaction is to get away as quickly as possible to avoid even more embarrassment as people swarm to the crash scene to see who was stupid enough to hit the dock so hard. Instead I have to stand there cranking with the rope as the laughter builds while the people on the dock point to that little red kill cord clipped to my belt, with the end dangling in the wind because I forgot to reinsert it into the kill switch. The only way I can deal with the safety stuff is to follow certain rituals. The ritual of plugging into a kill switch so you can start an outboard is one of many. If it’s an electric start outboard, I wrap the red kill cord around the key. If it’s one I start by pulling a cord, I wrap the red kill cord around the handle on the starting cord. Outboard rituals extend beyond dead man’s switches, and it’s best to know them all. Some you must pull the choke to prime, some you squeeze a bulb to prime, some you do both. Some you turn a throttle before starting, some you turn a knob before starting, some you push a lever. Some you mix the oil for the engine, and some you hope the engine is mixing the oil for you. All must be put in neutral before pulling the cord, but some won’t go into neutral until after you pull the cord. And some you put in neutral with a lever on the side, some a shift lever in the cockpit, and some the twist-grip control. And then comes the pièce de résistance: the pulling of the cord. 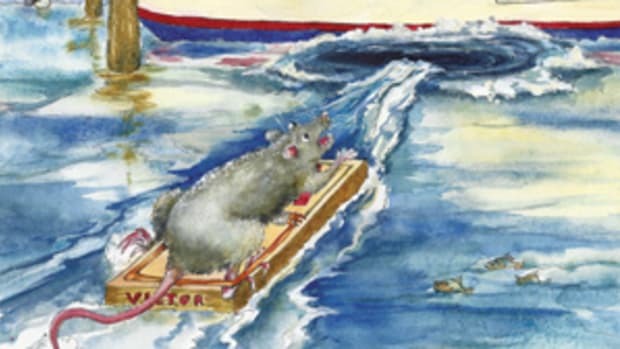 If you’ve run out of fairy tales to read to the kids, just pull out your outboard manual and read about “pulling the starting cord until the motor starts.” Of course, electric starts have taken care of all this. It was years before I had my first electric start, and I’ll never forget how wonderful that was, even though it was on that 75 that had been thrice sunk. It’s great when you push that button and hear the engine roar. But the greatest thing about electric starters is you don’t have to worry about fixing the recoil mechanism — that perverse system of springs, cogs, lever and wound rope that rewinds the starting cord over and over again after you’ve pulled it out over and over again. Recoil mechanisms are great when they work, but it doesn’t take much for them to break, and fixing one of those things is like trying to coax a worm through a straw. 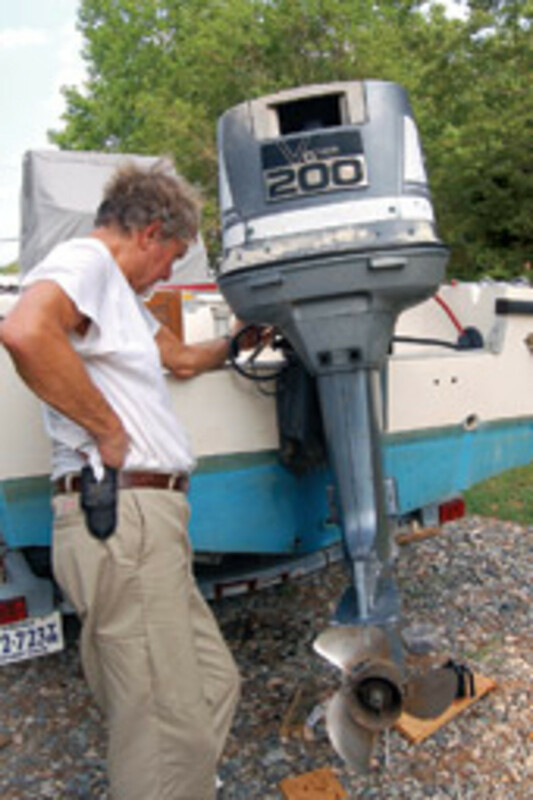 The recoil mechanism is just one of many peripherals on an outboard that are exceptionally difficult to repair. More often than not, I’ve found that with my outboards the devil is in the peripherals, not the motor itself, which would actually run well if all the other tacked-on stuff would just work. 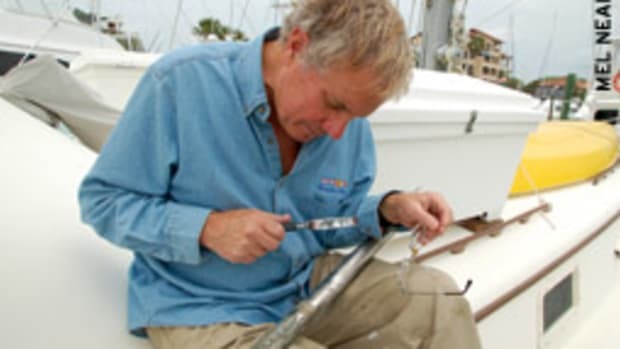 For example, fixing the water pump on some outboards is like trying to do brain surgery on a cockroach while you’re blindfolded. You remove a small plate in the lower unit, opening very limited access to the connection of the upper and lower ends of the shift rod. You have to insert a socket wrench (one you don’t mind never seeing again) into the opening, feel around for the bolt that joins the union, slip it over the bolt (if you guessed the right size), and unscrew it. Then you have to get the bolt out of there without dropping it deep down into the lower regions of the lower unit. After that you can drop the lower unit and find the pump and the bolt that you dropped. The entire time you’re fixing the pump you’re wondering how the heck you’re going to get that union lined up and the bolt back in there without dropping it into the nether regions and having to pull the thing apart again. You finally find out it can’t be done except by hiring a surgeon who specializes in laparoscopic procedures, and most of those guys have enough sense to operate on people, who are much easier than outboards. I’ve got two outboards where they’ve improved on the process. The gear is shifted by a turning shaft rather than an up-down motion. You just have to remove the bolts to drop the lower unit and insert the male splined end into the female splined end and reassemble. But on these motors they hid one of the bolts attaching the lower unit under a zinc. Usually when a part doesn’t easily come off after I’ve removed all the bolts, I tap it with a hammer, increasing the severity of my taps as needed. The first time I tried this with one of these outboards I accomplished nothing but further damage. But it sure was fun. As best as I can remember (and it’s tough to remember — it’s been too many years and too many outboards), the only outboard I ever owned that had virtually no peripherals was a British Seagull. 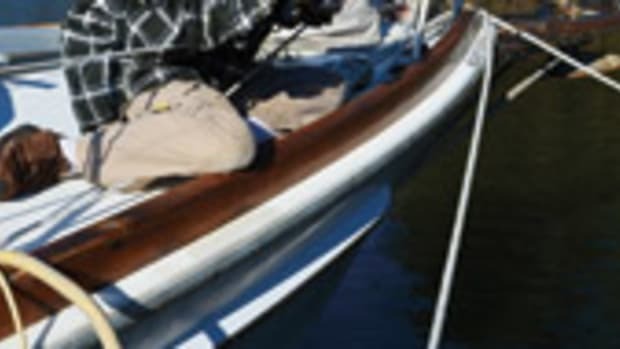 Partly because of its beautiful simplicity, it was the alleged paragon of outboard virtue, touted in every cruising magazine as being the only outboard that a true-blue, tough cruiser would have. But my peripheral-free Seagull had another problem. It never ran anyway. In case I’m insulting anyone here, let me clarify that this was a very long time ago and this particular Seagull had suffered through many previous owners. And I’ve heard that thousands of owners loved their Seagulls. I just never met one. Except the guy who sold me mine. But I think he was exaggerating a bit. One of my outboards today is a 1985 200-hp beast hooked to the stern of my 20-foot Mako. The actual motor part keeps starting, and it keeps running. It’s magnificent. But its peripherals (of which it has many) break with wanton abandonment. I can’t afford to pay someone else to fix them, so I spend hours repairing a motor that fundamentally works. I sometimes find myself wishing that the thing would just act like most of my other outboards and stop running so I’ll be forced to buy another one when I win the lottery. Each spring I go through a ritual of getting that motor ready to run. The first job is to chase out all the creatures that have taken up residence under the cowling in critical nooks and crannies, such as the air intake and carburetor throats. Field mice and mud daubers are the most prevalent intruders, with an occasional bird’s nest. Two springs ago, I had to roust out an unexpected visitor when I pulled the cover. But after the normal prelaunch prep, I put her in the water and she ran beautifully. She gave me a glorious ride back to the dock, where I shut her down and pushed the button to tilt the engine up. The hydraulic motor whirred, but nothing happened. All looked normal, except for a little sheen on the water. I threw in an absorbent pad, which I’ve learned is mandatory equipment for old outboards (and new). I brought it back for work, thinking dolefully, if I can’t fix this no one else will because the parts and labor are probably worth more than the engine. I found that the fluid chamber was empty. Must be a leak somewhere. Maybe that’s where the sheen came from. I filled the chamber, let the air bleed out, and the motor tilted again. As I raised and lowered the engine, I saw no leaks. Then I noticed something very strange. On a small bolt at the bottom of the left fork of the mounting bracket, I saw a bead of oily fluid. This bolt had nothing to do with the tilt hydraulics. It wasn’t even below any part of the system. Hydraulic fluid couldn’t possibly have dripped onto that little bolt or migrated there. I wiped the drop and operated the tilt motor again while watching closely. No leaks. But there was another bead of oil on that bolt. I wiped it off again and operated the tilt motor again. And again, no leaks anywhere. But again, a drop materialized on that bolt! So I crouched down with my face about a foot from the bolt, and operated the tilt, watching intently. A bead formed on the bolt, and I noticed very fine spots of oil on my glasses. I finally realized that a tiny, almost invisible stream of fluid was being sprayed on the bolt, across space, from a curled stainless high-pressure hydraulic pipe under the ram. This only happened when the tilt motor was running. The pin hole in the pipe was so small I couldn’t see it no matter how closely I looked. Voila! The new stainless pipe cost less than $30. After several hours of work, the engine was back in business. If I’d had to pay a shop to do this, I would have been charged a small fortune. Since then, the engine has given me two more seasons, running magnificently during each — except for the breaking of more and more peripherals. But when this motor runs and I’m streaking down the river or across Chesapeake Bay, it gives me a pleasure I can’t begin to describe. Each ride is like the first ride with my 5-hp years ago. Fact is, I don’t see how I could have survived without outboards these many years on the water. With a good outboard on a good boat, the garden out here isn’t all that bad. And somebody else knows that, too. That unexpected guest two springs ago was a small black snake.